Did you know that the average Canadian spends 90% of their time indoors and that indoor air is 2 to 5 times more polluted than outdoor air? Health Canada has developed Air Quality guidelines that summarize the health risks posed by indoor pollutants like dust, mould, pet dander and bacteria. Health Canada recommends limiting exposure to indoor air pollutants in order to avoid potential health problems that can result. You can find more information on this study here. Breathe easy this year knowing that Bionaire air purifiers and the aer1 filter series are the ultimate team to help reduce allergies like rag weed and pet dander, dust and even bacteria that cause colds and the flu. 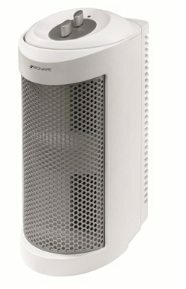 Air purification systems like the Bionaire® Mini Tower Air Purifier filtration removes up to 99.97 per cent of airborne contaminants to help reduce allergies, dust and other effects of indoor air pollution. It is the first filter system customized to effectively address your specific needs. Aer1 filters help reduce up to 99.97 per cent of air pollutants while eliminating odours and fighting germs. I have tried the Bionaire Allergen Remover Mini Tower and I am pleased with the results thus far. With my Mini Tower, my kitchen and dining area smells fresher with the Arm & Hammer Odour eliminator. We’ll see how it helps those sniffles over time too. I am giving away one Bionaire® Allergen Remover Mini Tower Air Purifier & 2 Bionaire aer1 filter series to one of my readers. This contest will run between from December 12, 2012 to December 21, 2012. This giveaway is for Canadian Residents only. Good Luck!